Body Tone class involves a high energy, high impact, all over body workout – usually about 30 minutes aerobic and 30 minutes strength and toning make up the class time. 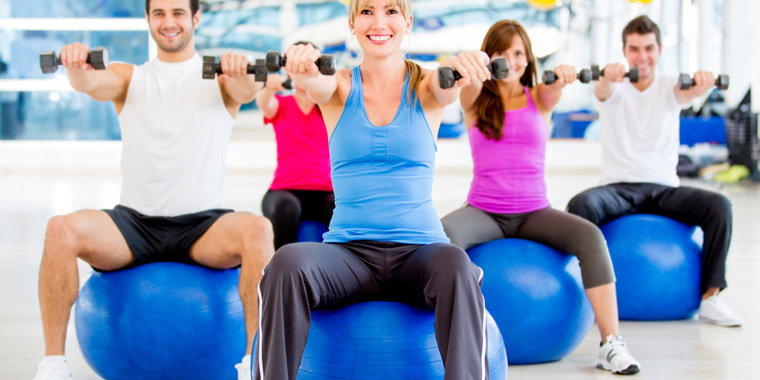 Toning is done using free weights, bands, body-bars, fit-balls or train-pods. It can be great fun but it’s always a lot of hard work so commitment levels must be high, as must your motivation levels! Body Tone will include jump jacks and running on the spot – realistically, it may require people with a fairly good level of fitness. With a repetition of previous Body Tone lessons, and the inclusion of additional movements such as squats and lunges based around an aerobic routine, you can start performing faster, deeper movements. Great for toning up, firming your arms, legs and abdominals, it can also help you to improve your general cardiovascular workout routine which will provide you with a better circulatory system and aid with increasing your fitness and endurance levels.